We had another good day today! Thank you Jesus! Jacob felt great! No side effects so far. The doctor said that could change as the week goes on and as it builds up in his system, but so far so good. We didn’t get a whole lot of sleep last night as they kept coming in to check on him and check his blood pressure, but at least all is well. He ate breakfast this morning and wanted to get dressed right away so he could go walk around. He was busy all day, going from one playroom to the other playing video games. 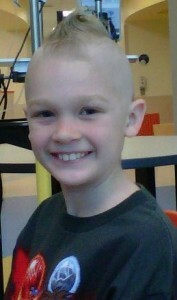 Rhys, the Child Life Specialist, came in this afternoon and gave him a mohawk. Normally, I wouldn’t allow this to happen, but since all that doesn’t matter anymore and just seems unimportant, I said why not!!!! He does look pretty darn cute! Not sure how long it’ll last as his hair seems to be falling out quite quickly. We had a tornado warning and watch for a few hours, so we had to go to our rooms and shut the shades. Makes you worried when you’re on the 9th floor. A while later, they had everyone in the hallway, but we had to stay in the room because Jacob was getting his chemo treatment. Scary! The storm passed and all is well! A little while ago, the therapy dogs came. Jacob was worried that they might not come because of the storm, but they did. We first had Izzy come in. A cute little daschshund. She was so cute. She gave Jacob lots of kisses. Next, Teddy Bear came in. He was an Australian Shephard and jumped right up on the bed next to Jacob. They were both so cute and friendly. Jacob loved to see all the tricks they could do. I love to see how happy he is when the dogs come in. He had chemo tonight at 6:00 and 7:00. Tomorrow it’ll start at 3:00 and they’ll shorten the starting time by 3 hours each day, so hopefully we can get out of here sometime friday since they have to give him 8 hours of fluids in his IV after chemo is done. Then back to Hastings. Please continue to pray for Jacob’s healing and that he will continue to not have any side effects from these drugs. I am so thankful that there aren’t any so far. God is so good!!! I will try to get a picture up soon. I still haven’t figured out how to do it! Awesome look Jacob, maybe Dad and Caleb should get one!